SIMER 2330 has float switch that may operate unattended. Uses a pressure switch to turn on at 1/2" and off at 3/16" but may vary. Max. capacity 1800 gph max lift 22'. 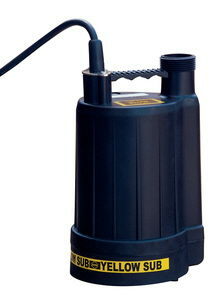 * Please call us for any questions on our pump 3/4 inch 110v submersible rentals in Portland OR, Gresham OR, Milwaukee OR, and surrounding metro area.